I would like to have the traditional and the newfangled banners alternating continually for my own shits and giggles, but making a .gif file is infinitely too schmancy for me. 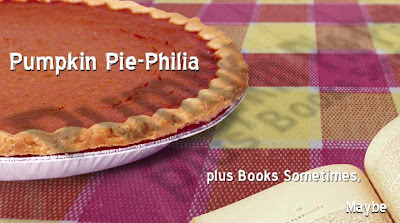 So this one will be the official footer of Bookphilia from now on, reminding everyone that pumpkin pie recipes could begin falling from the sky at any moment. What fun! My son would love to have pumpkin pies themselves to be falling from the skies. I would prefer recipes. Darren can't turn it into a gif for you? It's really pretty simple; all you have to do is re-save it. Yum indeed. I think my first pumpkin pie recipe posted here will be for rosewater pistachio cupcakes.